The holiday shopping season has officially begun, and I started to receiving hundreds of emails about sales, so tempting..! Did you shop past weekend (Black Friday to Cyber Monday)? I didn’t at all because I didn’t want to add even one little item before moving out. 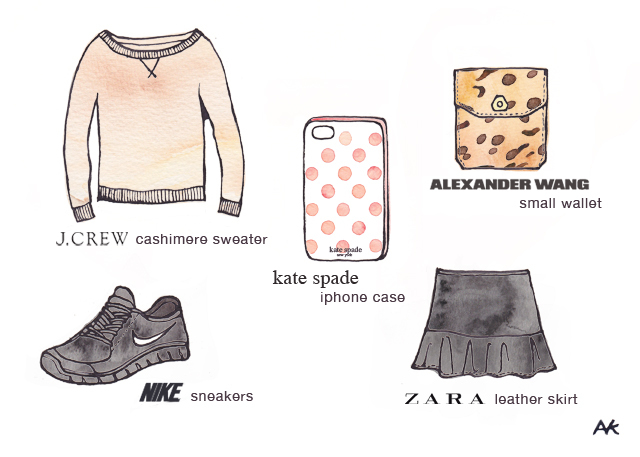 However, there are many cute stuff out there, and here is my drawing of my wishlist I don’t mind to have it..! AH! 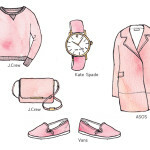 I love your illustrated Wish List! SO ADORABLE! Beautiful Akiko! Cashmere pullovers are indispensable during the chilly winter season! This is adorable Akiko! I love that you drew everything… and everything on that wish list sounds good to me!! I’d want to have every single item on this wish list! What about following each other on BlogLovin and Twitter??? Your wishlist is now part of mine. Love the pink stuff Akiko! Thanks also for visiting my blog and commenting. Hope you can follow each other? And I love that it is illustrated! I tried not to shop too much also. LOL. I hope Santa brings you everything you want! I want so bad the nike sneakers (free run) since, like a few months ago but my parents don’t want me to buy NIKE stuff, like, “ethicissue”. UGH. GO for it, I support you totally, I love their futuristic side and, being feminine wearing sneakers is harder so more feminine than being and wearing heels. PS : nice drawing, as usual, you know I4m such a big fan.